Many apologies � the fact of the matter is, we were meaning to pen an impressively comprehensive review of Steamboy, incorporating our many years of anime enjoyment into an eloquent passage that would thrill and illuminate all. Unfortunately, we could not build up the requisite, uh, compressed vaporous metaphor to get started, so we realized what it all (hah!) boiled down to was this: Seattle Maggie loves gears. The more gears, switches, levers, and elaborate machinery there are, the more we love it. Case in point would be the example of the similarly boyish Hellboy which, while admittedly not a great movie, will forever be fondly remembered because of its proliferation of cool clanking, whirring machines. 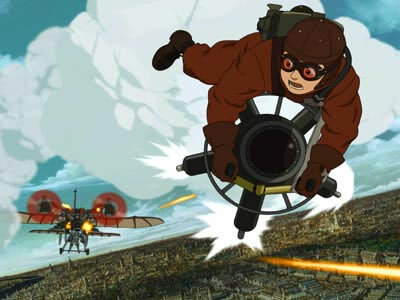 Steamboy has more gears than anyone could want, from the giant flying citadel to an inside-out motored unicycle to a wild-flying steamball, and we just ate it up with a spoon; however, we could have done without some of the heavy technological posturing ("Science will SAVE mankind!" "No, Science will DESTROY mankind!" "SAVE!" "DESTROY!" �Your MAMA!� �Don�t EVEN go there!�) as well as the fluffy side story involving the snobbish young heiress Scarlett O'Hara. Director Katsuhiro �tomo, the creative mind behind the classic mind-melt anime Akira, stretches the art of animation to its limit and, as turn-of-the-century London was blanketed by a frozen explosion of tiny ice crystals, we wanted to stand up and applaud. Steamboy is playing until Thursday at the Varsity, dubbed in English with an all star cast that includes Anna Paquin and Alfred Molina, and all late shows will be shown in Japanese with English subtitles. Our Inner Geek would only allow us to see the latter, but we hear that the dubbing is actually halfway decent. Now, if only someone will explain what that random montage during the credits was all about. Let us jump to a shout-out to reader Liz, who sent us our first Seattle Maggie fan email (we are seriously all a-flutter!). Knowing our shameless penchant for tear-jerkers, she was kind enough to let us know about Hard Goodbyes: My Father, playing for a week at the Grand Illusion beginning April 22nd. This little import from Greece tells the story of a pact between a young boy and his father to see the first man walk on the moon, and promises some creative flights of fancy and whimsical storytelling. Warning, tough guys: be sure to stash a couple extra tissues for some surreptitious eye-dabbing. You can always blame it on your allergies - while we are fond of the ol' Grand Illusion, we are guessing that it probably still smells a little like cats. And lastly, during a preview for Major Dundee: The Extended Version, Seattle Maggie could not help but notice as the guy sitting next to us began to twitch visibly. The inevitable thought raced through our mind as we scrunched away in the opposite direction: "Why? Why did we sit next to the crazy guy at the movies?� As the preview came to a thunderous close of galloping posses and rifle blasts, our neighbor's frenzied jiggling also seemed to reach an orgasmic peak. With unrestrained joy and excitement, he rapturously hollered out, "I LOVE PECKINPAH!" then quietly collapsed into an exhausted state of post-Dundee bliss. What is it about the directorial stylings of Sam Peckinpah that could inspire a verbal explosion of such heady delight? As we are not huge fans of the Western, we can only wonder...and perhaps check it out at the Varsity, starting April 22nd.